Our decision to partner with Protect-A-Child as a distributor was influenced, in part, by our other safety-related company, which focuses on protective products in law enforcement. The addition of Protect-A-Child’s pool fence has proved to be a nice add-on to our menu of services that safeguard the lives of children, pets and the elderly. 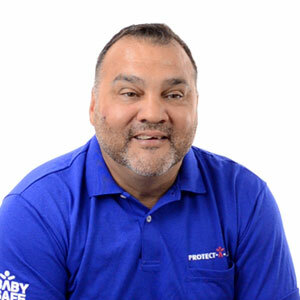 My involvement in water-related services influenced our decision to represent Protect-A-Child. To be specific, I was impressed by the manufacturing side of what Protect-A-Child does. Their use of unbreakable fiberglass support posts far exceeds the required Miami-Dade pool fence code, which truly sets them apart from all the competition. Companies everywhere are trying to cut corners to save a buck, but Protect-A-Child goes that extra step because pool protection and safety is truly at the core of their mission. My experience as a U.S. Coast Guard boat captain, PADI-certified scuba instructor and service in the Coast Guard reinforces my strong belief in the preservation of life. Our customer service style is rooted in delivering knowledgeable, timely and respectable service, as it is vital to our relationships. We take pride in educating customers on their options and the pool fencing installation process in order for them to make informed decisions. Our customers can also expect accessibility to us before, during and after the installation. It is our promise. Our team was taken by this elderly man’s reason for securing his pool. His wife, who suffers from Parkinson’s disease, had a near drowning one month before contacting us. Now, they both can relax and enjoy their orchid garden by the poolside. After losing one of her three dogs in a pool drowning, our customer decided to get a pool fence to keep her remaining two dogs safe around the pool and protect their new baby on the way. She was unable to pay in one payment, so we provided her with a payment plan. She appreciated that we were the only company to care more about the safety of her dogs and future child than her ability to pay. If you are looking to get a pool fence or safety barrier for your home or business, please contact us today at (305) 496-4219, or fill out the form below for your free quote. We look forward to providing you with the peace of mind about the safety of your children or pets around the water that many other Miami residents are enjoying, as you can read in these pool fence reviews from Miami customers.